FCT was asked to develop an IPC Class III part for an international supplier of components and assemblies to the automotive industry. Due to the complexity involved along with stringent customer requirements and anticipated higher volumes, FCT was required to make investments into one of our facilities to shore up our ability to meet the overall requirements. This included adding SMT lines and upgrading some of the equipment in order to achieve all criteria to the customers satisfaction. FCT went to work in support of our Asia based manufacturing facilities and helped obtain the equipment that would be needed to be successful with this program. Additionally, we supported the work flow processes and helped set up two new and dedicated SMT lines for this program. We also supported the facility in implementing added quality programs, above what had been standard, to assure that we would meet all customer requirements. FCT has successfully supplied this customer with these components for the past 4 years. 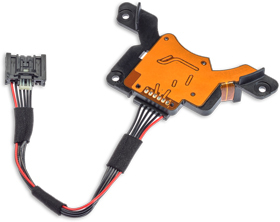 The program continues to expand and today our flexible circuit assembly, combined with our customer’s overall product solution, are incorporated into several major automobile brands across the globe. We are extremely proud of our ability to work with this customer. Not only did we meet their needs, we also stepped up in a short period of time to assure that all required equipment and processes were in place to successfully meet the demand and overall requirements. With this project, FCT faced unpredictable customer demand for products against challenging lead times on both ends. Our direct customer’s needed to offer their customers short lead-time in an unpredictable sales cycle. FCT in turn, needed to offer short lead-time in spite of this unpredictability and long lead-time for material used on the flex circuit. FCT and our customer resolved the procurement challenge by working closely with the end customer’s procurement department in mapping out a Just In Time (JIT) delivery plan while utilizing FCT’s inventory/stocking program services. The customer provides FCT with detailed weekly forecast updates along with consumption rates and their on-site inventory status. This allows FCT to properly purchase the long lead materials and plan production batches while supporting overall inventory management. This allows our customer to turn the inventory of flex circuits in excess of 40 times per year without any line down stock outs. The ability to provide support to our customer relating to; JIT delivery, support in stocking and inventory management plus more, has led to a close working relationship between our organizations. This value added service helps our customer to meet their production schedules and end customer needs without the worry of getting caught in a line down situation. By providing the customer with value added services we have been able to develop a long term relationship that continues to grow for both of our organizations. FCT was asked to produce a circuit with a very tight trace & space requirements with portions exposed on both sides of the circuit; unsupported traces in effect. The traces were specified at .0025” and the spaces at .005”. We knew the unsupported traces would be damaged if we utilized typical design, manufacturing and packaging processes. After careful consideration, we designed a removable protective shield to stabilize the circuit during the manufacturing process. In addition, we packaged each of the circuits individually. While both of these solutions added cost, they were necessary for the success of our customer’s program. By partnering with our customer’s design and quality teams from the early stages of development, the dividends realized were great. Production yields improved from 15% during the test stages to more than 90% after full implementation. Together we figured out how to mass manufacture a circuit that seemed impossible in its early stages. Combine an existing PCB with an existing molded assembly, utilizing a metal dome for a tactile switch. The switch had to be activated by the edge of the PCB instead of a fingertip and the unit had to withstand 100% humidity and extreme heat for 10 days. Not only did the unit have to successfully withstand extreme heat and humidity, but also hold up during a four foot drop test. First, we had to devise a way to fully enclose the switch so that the humidity could not penetrate. At the same time, an escape route for the compressed air during switch activation was needed. We managed to accomplish consistent, reliable results with a combination of polyimide tape precisely cut and aligned with protective oil. Next, we used a combination of epoxy and protective oil to protect the exposed surfaces. Finally, the snap dome was to be activated by the edge of a PCB, which is an atypical usage. We modified the metal dome switch so that it did not have its contact point fully encased in the diameter of the switch. By making this modification, we were able to accomplish multiple activations without false or missed contacts. Because of the thoughtful selection of materials and “out of box” thinking in design, Flexible Circuit was able to create a device that met the heat, humidity and drop tests required by our customer. FCT was provided with a small, relatively simple, prototype design for a lighting instrument. In utilizing the customer’s design the initial prototypes were not fully satisfactory and we were challenged to meet the desired application requirements. Additionally, beyond the design challenge there were manufacturing and assembly challenges that had to be addressed in order to successfully provide a product that would meet the customer requirements. FCT was asked to provide design input in order to optimize the solution and performance. Our suggested changes were made, and prototypes were built. Additionally, FCT’s manufacturing and assembly team worked through the fabrication and assembly challenges. A particularly difficult challenge had to do with fabrication. We needed to hand-place a very small rectangle (less than 1/10th of an inch square) of thick heat transfer tape onto a very exact footprint assuring adhesion to the flex. These issues were successfully worked through to success in the prototype stage. The customer was seeking a thermal sensor flex using a resistive foil and selective copper plate. The customer’s flatness specification could not be met with the original design making the design and product application very difficult. FCT analyzed the design and based upon extremely “close quarters” (thickness tolerance) in the customer’s product options to revise the stack-up to improve flatness were extremely limited. FCT developed a test matrix that involved 3 alternative designs and constructions for the solution. Through this matrix we were able to land on the most prudent design that achieved the required flatness specification while accomplishing the overall requirements for the application. The successful solution development led to overall program success including consistent production volumes for the first few years of the program and now has led to increased volumes required by the customer over the past two years. Our customer had designed a Flex Circuit solution that would meet their demanding environmental requirement and need. The successful flex solution called for a high temp film that was not widely used in Industry. The identified high temp film was a “must use”; due to its excellent dielectric, low moisture absorption, high temperature resistance and food grade properties. This material required a very high temperature lamination process and would require significant process development effort. The customer was having great difficulty in finding a FLEX supplier that could successfully laminate the material on their design. This required a high temp press / time monitored process to properly seal the circuit without published knowledge of how to best accomplish this. FCT resolved the Flex Solution challenge by initially researching the properties of the particular high temp film that was to be utilized. FCT then located a high temp press and subsequently developed and tweaked the process to successfully laminate the material with polyimide flex base. FCT was the first supplier to successfully laminate this material in production quantities while meeting the end customers quality and cost objectives. FCT was able to develop a successful solution to this challenging application where others could not. By meeting our customer’s demanding needs; we were able to gain the customers trust that has led to a very successful long term relationship. Today, our relationship continues to grow as FCT has met additional customer demands for new flexible circuits using this material. We are currently working with our customer on a new project that will continue to grow our market share with this customer going forward. An International Customer located in Eastern Europe came to FCT for support in the design and fabrication of an extremely difficult flexible circuit component. 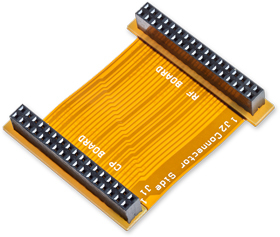 Challenges included supporting the design and development of a part that is ~0.61”wide x ~74” long, that consists of 7 separate 2-Layer circuits soldered together with gold plated traces all exposed on one side; with 28 SMT components needing to be mounted to the other side, and a 60 mil polycarbonate stiffener applied with the adhesive on both sides the full length to the components side, and then all components encapsulated with epoxy. The part was extremely challenging when considering manufacturability. FCT took this project on knowing that it would be quite challenging. We worked with our manufacturing facilities to work through the considerable challenges that we would face during fabrication. FCT successfully worked through the various issues that required considerable manufacturing achievements that led to the successful development of this product while meeting strict customer requirements. This led to a successful program and a very happy customer given failed attempts with past suppliers. Customer needed a supplier of a simple jumper with connectors attached. They were not even sure if their previously-built parts contained or required plated through holes or not? At times customers come to FCT with more questions than answers or with varied skills or they may not have the internal engineering expertise that they would like. In these cases, it is our job to help and to do what we are able to get to the solution that will best meet the customer’s needs. FCT worked through the application with the customer by gaining a detailed understanding for the application requirements and design; we then developed and got confirmation on the design and then built First Articles in front of an order for 1,000 assemblies. The First Article parts were accepted and FCT has completed production of the first 1000 assemblies. The customer communicated to FCT the following: The parts appear to work well and cosmetically they are great…. I really like working with you guys… we’ve approved the cables, they look terrific and the quality is excellent. An international customer located in South America came to FCT with an application and flex product need that involved an extremely challenging design. 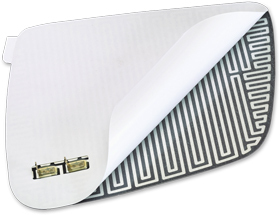 The customer sought to develop a screen printed silver circuit for the security of their POS Handheld CC Reading Device. Copper could not be used as it was too easy for intruders to bypass. Additional requirements called for traces that could not be seen from the front or the back and half of the parts must fail like a tamper resistant label while the other half of the parts must be strong, must perform and could not fail. FCT was able to work with the customer to develop a design and product that met all of the extremely challenging requirements inclusive of passing stringent post production testing requirements; leading to a successful program that met all customer criteria against what seemed to be nearly impossible requirements. 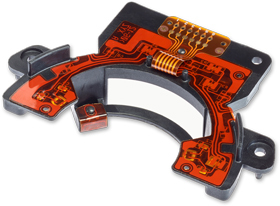 FCT was successful in solution development for this extremely challenging part and to this day we believe this to be one of the most challenging and unique flex circuit components that we have developed. FCT believes that many in the industry would have been challenged to figure out a workable solution and/or would have simply passed on the opportunity due to its complexity. The customer was dealing with a complex application and while working with others could not attain a successful Flex Circuit design that would perform against the requirements for the application at hand. 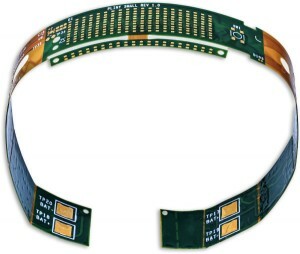 The Customer had been going through the design and development process with other suppliers related to designing a flex circuit for a wrist worn athletic/activity tracker. 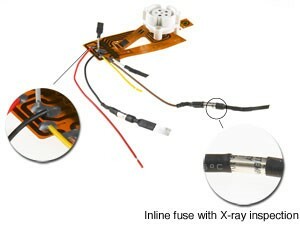 The product was to contain a complex and dynamic flex circuit. Prototypes from multiple flex suppliers had all failed to survive over molding and bending tests. The customer was becoming discouraged as attaining a successful design was proving to a difficult challenge while development costs continued to rise and the timeline continued to slip. FCT was called in to review the design. Several design changes were recommended and made related to the design, construction, and conductor routing. 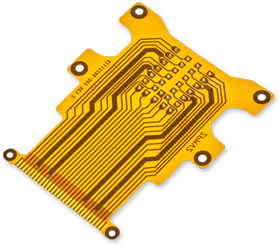 FCT supplied proto-type flex circuits using the new enhanced design and the new circuits performed perfectly while meeting the demands of the application and meeting customer expectations. FCT was able to develop a successful solution to this challenging application where others could not. 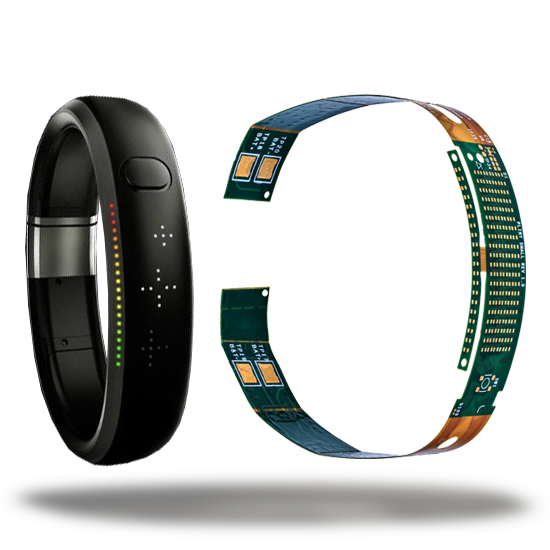 Based upon the outstanding performance of our design the customer was able to achieve one of the most successful product launches to date within the Wearables market. FCT’s superior design expertise coupled with providing a flex solution at a competitive price led to a successful program and satisfied customer. We also supported the customer with inventory/stocking program in meeting their production schedules. FCT produced over 2 million of these circuits in production and was the sole source for this large and successful program.